William Bradley “Brad” Pitt is an American actor and film producer from Shawnee. Pitt initially gained recognition when he played the role as a cowboy hitchhiker in ‘Thelma & Louise’. He is today known as one of the best actors of all time. He has starred worldwide in films such as ‘Seven’ (1995), ‘Fight Club’ (1999) and ‘Ocean’s Eleven’ (2001). As of 2019, Brad Pitt’s net worth is roughly $300 Million dollars, making him one of the richest actors in the world. William Bradley “Brad” Pitt was born in Shawnee, Oklahoma on the 18th of October, 1963. Pitt is the son to William Alvin Pitt and Jane Etta. He was born into a conservative household and raised as a baptist. Pitt attended Kickapoo High School where he was a member of the tennis, swimming and golf teams. At first, his focus was to become a journalist but he started his acting career in 1987 when he took acting lessons from Roy London. Pitt began his acting career in 1987 when he had minor roles in films such as ‘Less Than Zero’, ‘No Way Out’, and ‘No Man’s Land’. Pitt also appeared in two episodes in the sitcom ‘Another World’ broadcast by NBC’s television network. The next year Pitt had a cameo role in the movie ’21 Jump Street’ which he was signed on as the main actor for the movie ‘The Dark Side of the Sun’. In 1994, Pitt was a part of an ensemble cast comprising Antonia Banderas, Kristen Dunst, Tom Cruise and Christian Slater in the movie ‘Interview with the Vampire’. The following year he was cast alongside stars such as Morgan Freeman and Gwyneth Paltrow in ‘Seven’. The movie was a huge hit at the box-office, earning $327 million. During the next few years, Pitt appeared in many successful movies such as ‘Sleepers’, ‘Meet Joe Black’, and ‘The Devil’s Own’. In 1999, Pitt was the cast in the movie ‘Fight Club’ which has come to be one of Pitt’s most popular movies. In 2001 the rising star played a major part in ‘Ocean’s Eleven’ alongside Matt Damon, George Clooney, and Julia Roberts. The film proved to a major hit at the box office with earnings of $450 million worldwide. In 2003, he started lending his voice to animated movies such as ‘Sinbad: The Legend of the Seven Seas’s and ‘King of the Hill’. Since then Pitt has starred in many world famous films and he is today know as one of the greatest actors of all time. As of 2019, Brad Pitt’s net worth is $300 Million dollars. Make the world a better place. While making donation and contribution to make the world a better place is a personal choice, studies have shown that people who care about others have a higher sense of gratitude and thus. When you feel grateful for what you have you will find peace and have a deeper joy in life. Making a huge decision can change the course of your life and can be a bit scary. These decisions, however, will shape the life you desire. If you chase your dream and take a lead of the faith you will become an ordinary person like everyone else. No matter what you do, be the best at it. When you put your heart into doing your best, the universe will reward you for the work that you have done. Be the best in what you do, always. There’s no doubt that Brad Pitt will continue to be one of the richest actors in the world. Pitt has been a successful actor since he was a teenager and today he has an enormous net worth. As of 2019, Brad Pitt’s net worth is estimated to be roughly $300 Million dollars. 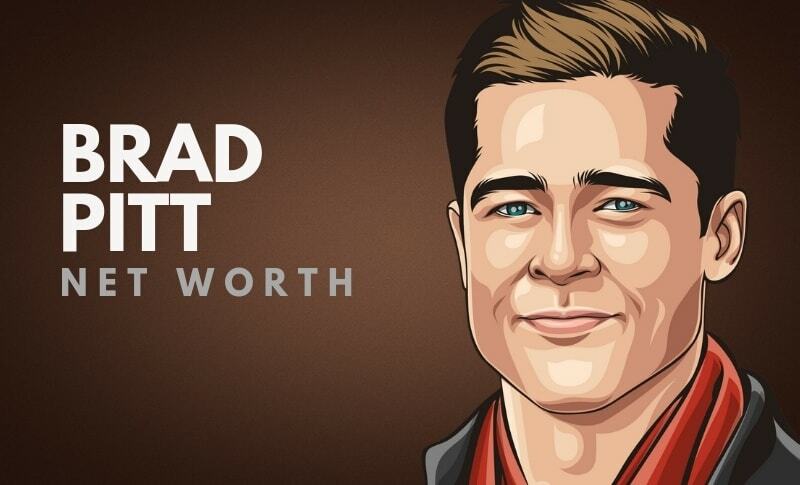 What do you think about Brad Pitt’s net worth? Leave a comment below.